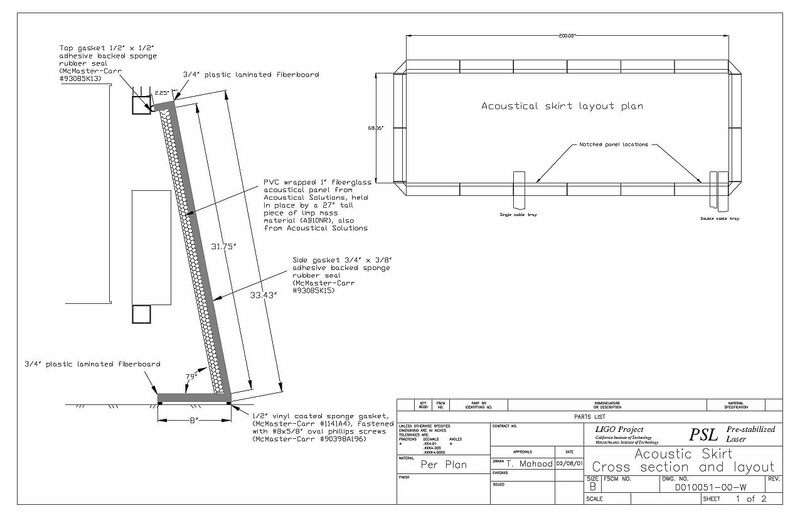 As I was approaching my impending Masters in Physics degree at Cal State Fullerton, I began to think I’d like to do a bit of work in that area, rather than go back to civil engineering. That turned out to be something of a challenge. After all, I was 47, hadn’t had a job in about 7 years (due to Retirement 1.0, Beta), my background was civil engineering, and I was looking for some sort of entry level science position. On top of that, my Masters focus was more toward Relativity and gravitation, not exactly a booming area. My resume must have looked extremely odd to recruiters. My dream job would have been with an outfit like Aerovironment, Los Alamos National Lab, or the Jet Propulsion Laboratory. But despite calling in favors from folks I knew, I wasn’t getting anywhere. Then one day, while doing a routine check of the JPL employment site, I ended up connecting over to Caltech and saw their employment openings. 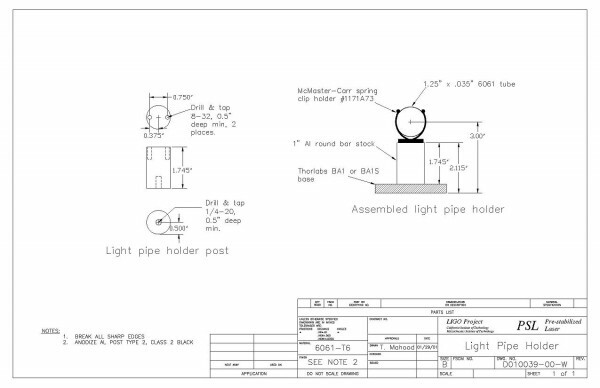 There was something posted for an assistant engineer at a facility called “LIGO”. That was Laser Interferometer Gravitational Wave Observatory in either Washington State or Louisiana. Wait….the word “Gravitational” was in the title! This sounded promising. It turned out LIGO was a massive project, funded by the National Science Foundation, to hunt for gravity waves. Gravity waves were predicted by Einstein in the early 1900s, but have yet to be observed directly. Measurements of the slowing of spinning neutron stars suggest they are giving off gravitational waves, but no one has seen one in the flesh. Part of the problem is gravity waves are so damn weak, and they pass through pretty much everything. 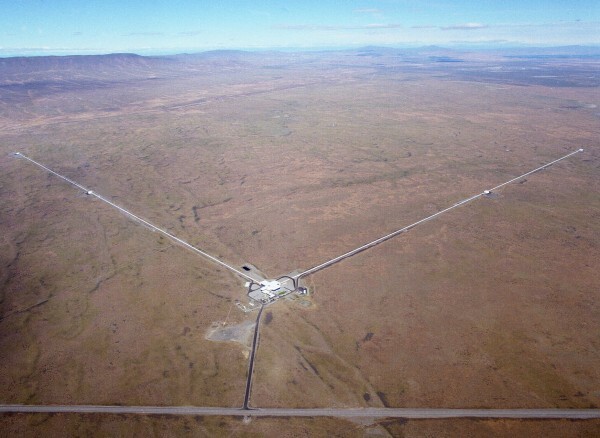 LIGO proposed to catch gravity waves with the use of a giant interferometer. 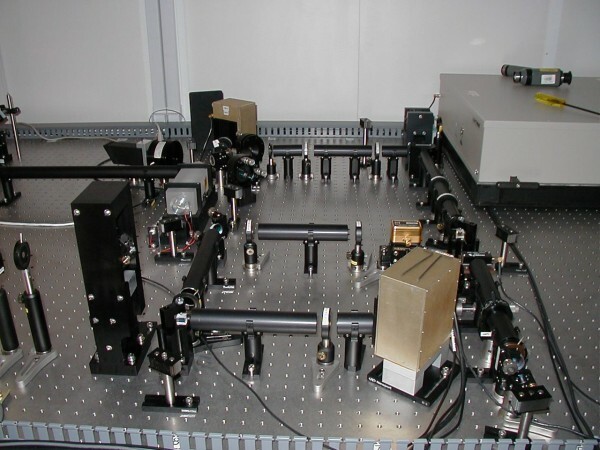 An interferometer takes a laser beam, splits it in two and sends it down two legs at right angles to each other. At each end of the legs are mirrors, which bounce the beams back to the center. If there’s any difference in the leg length, say caused by the passing of a gravity wave, the two recombined laser beams create an interference pattern. The LIGO setup was so exquisitely sensitive, it could detect a change in the length of a leg on the order of a proton diameter. Now THAT’S small! Here’s a brief summary of how the thing works. Oh, did I mention that each of the legs was 4 kilometers in length? That’s 2.4 miles for you metrically challenged. There is a LIGO interferometer in southeast Washington State on the Hanford Reservation, and a duplicate in Livingston, Louisiana, east of Baton Rouge. The idea was that two interferometers were needed to verify the passage of a gravity wave as well as get an idea where it came from. During the job interview process, I was pretty much given a choice to work at either of the two facilities, and immediately jumped at the Washington one. After all, it was in lush, green Washington, with lots of mountains to explore. Uh, not so much, I later found. 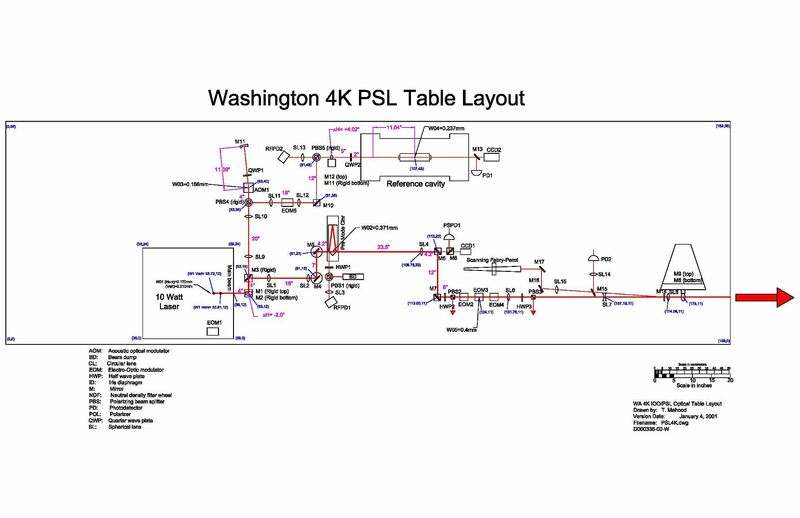 The aerial below shows the LIGO Hanford layout. The cluster of buildings in the center is the LVEA (Large Vacuum Equipment Area) and essentially was a high level clean room that covered about an acre. That’s where the control room, offices, machine areas and lasers hung out. The two arms were X and Y (Imaginative for scientists, eh?). There are actually two interferometers there, but it’s not readily apparent. The 4 kilometer interferometer ran its laser beams all the way to the ends of the two arms before returning to the LVEA. The two kilometer laser just used half of the arm lengths. The buildings at the middle of each arm were the Mid-X and Mid-Y buildings, which housed more vacuum pumps and the mirrors for the 2 kilometer interferometer. There were also structures at the ends of each arm for vacuum pumps and the mirrors for the 4 kilometer interferometer. What was amazing was the staffing of this sprawling facility. Normal staffing was only about 22-25 people. We were there all the time. But that was supplemented by PhD’s from MIT and Caltech who would come to LIGO for several weeks at a time. They’d stay in motels in Richland or Kennewick and were all scary-smart people. During Summer, a horde of what were called SURF students showed up from schools all over the country, as sort of a summer internship. So the facility would see large swings in population. But for the core group, it was just us, only a handful of people. Oh yeah, note the bleakness of the surrounding area in the aerial. All the ugliness of a desert, and none of the charm. No cactus, just grass and tumbleweeds. Turns out that pretty much SE Washington State in a nutshell. Jeri and I found a pleasant three bedroom rental in Kennewick, which was one of the “Tri-Cities”, as the area is called, the other two being Richland and Pasco. This conglomeration of cities, at the intersections of the Columbia, Yakima and Snake Rivers, totaled about 115,000 people. One would think that would be enough to bring a certain cosmopolitan level to the area, but it didn’t. It was pretty much the sticks. Restaurant choices were disappointing. One time we drove over two hours to Spokane (the nearest “large” city) just to eat at a friggin’ Marie Calendars. OTOH, the farm and feed stores were a hoot. I didn’t know there were so many devices to castrate animals. My job at LIGO was sort of a jack of all trades. Whatever scientist needed help, I was an instant assistant. When it was found I had a good amount of machining experience (thanks to my Masters in Physics!) , that changed things a bit. LIGO had an excellent machine shop but only a few people knew how to use it and had access. In fact a couple of the scientists were expressly forbidden to touch anything in it after previous disasters. Scientists like to experiment and learn as they go, something that gets expensive with a machine shop. But I had full access. Some of what’s inside the LVEA. That vacuum tube is 2 meters in diameter. Eventually I got assigned an office with two other new guys. It was fairly obvious to me that this was LIGO management’s attempt to keep the staff losers and misfits in one area, then watch over them closely. Bill Butler was a post-Doc from the University of Rochester and Rick Graf was a local boy, raised in the Tri-Cities. Being a post-Doc, Bill was perennially poor, so his modes of transportation were always…interesting. His first was a vintage Mustang, which he ended up rolling at high speed off a freeway on the ice and walking away unscathed. This was replaced by a piece of crap motorcycle, which he managed to ride even in the snow….if it started (Bill eventually left LIGO to make big bucks with Intel). Where Bill was an incredibly nice and pleasant person, Rick oozed cynicalness and snark. Rick probably wasn’t a good match for LIGO in general, but was a great match for our specific office. It was Rick who informed me the alternative name for the Tri-Cities was the “Dry Shitties”. I liked him right away. Because the LIGO facility was about 20 miles or so out of town and looked mysterious, it puzzled a lot of the locals. This despite press coverage and monthly public tours. At one point there was a rumor making the rounds in Richland (I’m not making this up!). LIGO wasn’t really a gravitational observatory. It was a cover for teleportation experiments. So far, they…..uh, I guess that’s “we”….. had been able to teleport a frog from the central complex to one of the end stations along the tube. But then we tried it with a dog. The dog didn’t make it……he exploded all over the end station. After hearing that story, some of the LIGO staff were seriously talking of making a transporter pad, complete with Star Trek transporter sounds, to be put over in a corner somewhere for the public tours. I was working in a fun place!!! 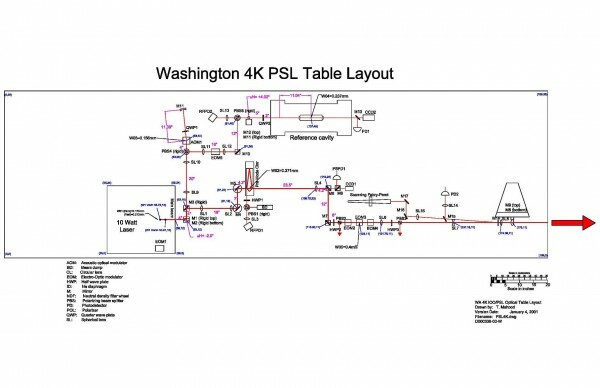 Me helping to set up 4K PSL optical table. Note stylish protective laser glasses. One evening I was working with one of the senior physicists, who was involved with making adjustments to the beam paths on the 2K laser optical table. 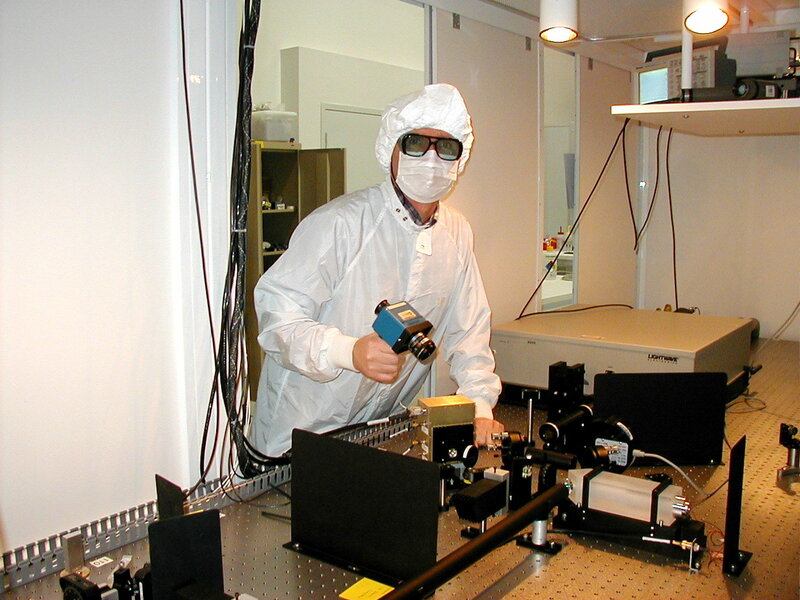 The laser wavelength used is 1.064 µm, which is infrared and not visible to the human eye. So I was using a viewer (which is like a night vision scope) to look for errant reflection spots as he was moving things on the table. Suddenly, the image flared and I wondered where all the glare was coming from. Pulling the viewer away from my eye, I noticed he was dangling the sleeve of his clean suit in the beam, and smoke was starting to rise. I pointed out his little faux pas, and he yanked his arm out to find a bunch of neat holes burned in it. As much as I enjoyed getting to play fire-spotter, it gave me the idea for “light pipes”. These were simple things, just black anodized aluminum tubes which shielded the laser beam on the table from air drafts and floppy sleeves. After my design below, we placed them on both the 4K and 2K lasers. Light pipe holder to keep from lighting cuffs on fire! 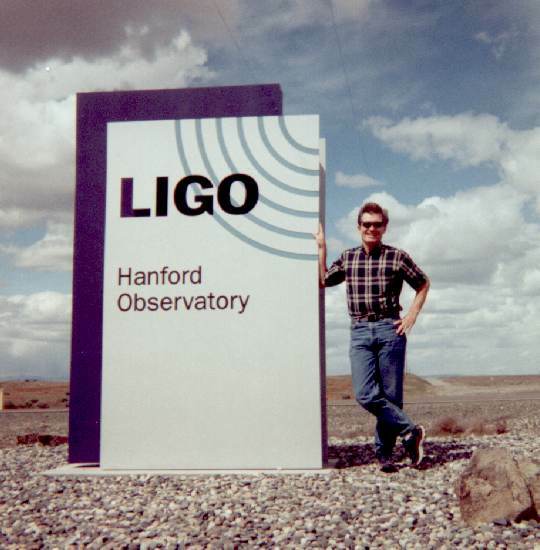 I got involved in all sorts of things at LIGO and became knowledgeable in a lot of areas. One of them ended up being acoustics. The LVEA was loud from all the vacuum pumps and air filtration going on. It was also where the delicate lasers were housed on heavy optical benches inside simple enclosures. Eventually someone had the idea there could be acoustical coupling with the laser components, and oh wouldn’t it be a good idea to sound-proof the enclosures? That got assigned to me, as I guess I was some sort of expert on noise (but it was really my loud office mates). So after a lot of experimenting, I whipped up the following design which was used on both the 2K and 4K laser enclosures. It helped a bit, but not as much as everyone would have liked as it’s hard to attenuate the lower frequency vibrations. My most memorable time at LIGO was in August of 2000 when we received a visit by Dr. John Archibald Wheeler, one of the giants in the gravitation field. He was the guy who invented the phrase, “black hole”. Wheeler wrote an amazing book that few have ever seen, called, “A Journey Into Gravitation and Spacetime” explaining General Relativity with almost no math. He was going to be driving in with Kip Thorne of Caltech from Seattle to Richland for the LIGO Scientific Collaboration and to tour LIGO. For some reason I was picked to stalk him for a few days and take pictures of everything. This included a very rare tour of the “B” reactor on the Hanford site. Since the thing was sealed up, the Department of Energy was trying to ding LIGO for around $3k to open it up and “certify” it as safe (Not that anyone around Hanford trusts the DoE anyway). It was then pointed out that Wheeler built the damn thing in the 1940s, so the DoE had a sudden change of heart and decided to eat the cost. On October 20, 2000, LIGO Hanford’s 2K interferometer achieved its first “lock”, a major event. This meant the mirrors were aligned just perfectly and fringes could be seen. That day was a bit of a media circus, at least by LIGO standards. Lots of NSF and Caltech bigwigs wandering about. Here’s a LIGO press release on it. I actually took the two pictures of the control room, and the lower of the two shows my office mate, Bill Butler, on the right side, leering at the camera. The bearded guy sitting in the center of that same picture is Dr. Stan Whitcomb, just a genius when it came to getting LIGO up and running and an outstanding guy to work with. Outside of work, things were less fun. Rather than being in lush Washington, we found the nearest national forest with trees and mountains was at least a two hour drive away, and damn near impossible to get to in winter. I discovered to my horror that after about 6 months I had exhausted every place to go that looked remotely interesting within a two hour drive. As an example of how low our threshold fell as to what constituted “fun”, we would sometimes drive to various dams on the local rivers to watch the barges go through the locks. And when that grew stale, we would go into the dams and watch the migrating fish swim past the viewing windows. Yeah, we were watching fish. After a visit to Southern California in January of 2001, it became clear that it wasn’t a matter of if we were moving back, it was when. We found we missed the deserts just too much. Winter in southeast Washington is just plain cold and nasty, overcast and below freezing for months. There was a two week period I never took my truck out of 4wd. Black ice was always a constant hazard in winter. We were so sun-starved at one point I looked on a weather satellite photo and found a hole in the overcast there hours away in Fossil, Oregon. So we drove all that way just for a few hours in the sun. We also discovered we didn’t want to live anywhere the TV weatherman uses the term “sunbreaks” in the forecast or where the surrounding terrain is called “The Scablands”. And to add financial injury to insult, after all these months Jeri had not been able to find a decent accounting position. 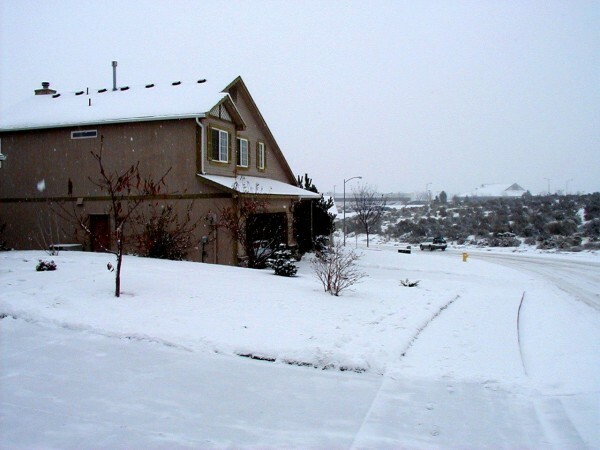 Our home in Kennewick in the middle of Winter. For a Southern Californian (by osmosis) this is a very traumatic sight. 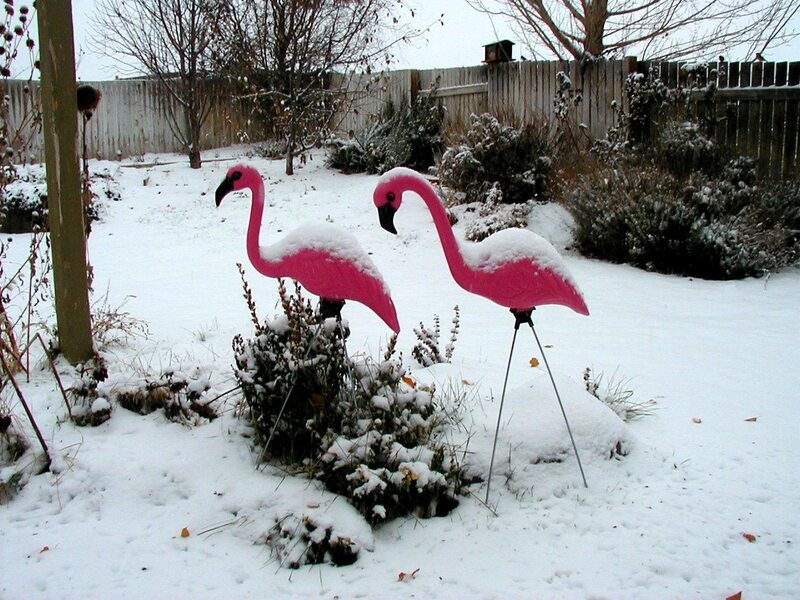 Yep, this scene in our backyard pretty much sums it up….Time to leave! I had been in email contact with old friends from my previous days of employment at the County of Orange who mentioned something about a “civil engineer shortage” in Southern California. Huh??! I had not heard of this. Suffice to say, after a flurry of telephone interviews I soon had a job offer to return to the County of Orange as a mid-level engineer doing traffic engineering, but at a 62% increase in salary over what I was then making at LIGO. So in March 2001, Jeri and I headed back south to Orange County, my LIGO days over. Let me be clear here. The salary at LIGO was poor, the hours long, the commute treacherous in winter, some of the people a bit wacky….. and it was the best job I will ever have in my life. As for southeast Washington, it was an excellent place to visit, but I wouldn’t (and didn’t) want to live there. If I had kids and wanted to raise them in an area with less opportunities to get into trouble, then maybe, but it could constitute child abuse. I am glad there are people who like living in the Tri-Cities, otherwise it would be a vacant wasteland (would it look much different??). But I, for one, think it’s a fine place to make Plutonium. My unusual detour through the world of science was incredibly satisfying but beyond that I learned something important: I’m a far better engineer than scientist. You see, scientists have to be able to be wrong a lot before they are finally right. That’s how research works. But I hate being wrong. And I want things to be as near to perfect as possible the first time. Ummm… That’s not science. There’s a fundamental difference between science and engineering, and it’s this: When a scientist is wrong, a new theory goes away or maybe a paper doesn’t get published. When an engineer is wrong, people can die. So like a minor league ball player who finally got his shot at the show, I could return to something I was pretty damn good at, and even liked, now that I got science out of my system. Ummm…Just an ever so minor, insignificant update: On February 11, 2016 LIGO publicly announced that for the first time in history, on September 14, 2015, gravitational waves were observed by both the Hanford and Livingston observatories. So there’s that.